1 HP garbage disposals are the most powerful among household disposers. Any with more power is used for commercial purposes. 1 HP garbage disposals are usually premium products with every possible features crammed into them. Since they are powered by a powerful motor these are ample for any household. People who buy these disposals are those looking for extra grinding power and features. These disposals can even dispose of hard food items like small bones and fibrous vegetables in small quantities. Since this is not the most popular category of disposals the manufacturers don’t mind adding extra features like noise insulation, auto-reverse technology and premium build even though they add to the cost. Ofcourse not every manufacturer follow the same premium level standards. Some manufacturers try to make these disposals more affordable but cutting those extra features. But in any case these disposals are really powerful and are an apt choice for those who needs extra grinding power. Here is my comparison of the best 1 HP garbage disposals. There are other 1HP disposals in the market, but I chose this owing to their popularity. As you know InSinkErator and Waste King are the leaders in this segment so naturally, they have the best in class disposals. Let me compare these models with one another to see how they are similar and different. All three garbage disposals have the same power 1HP. That’s definitely because this is a comparison of the best 1HP disposals. 1 hp disposals are ample for a family of 3-5, and they can even grind hard food wastes like small bones which most other low-powered disposers can’t. This is the most powerful a household disposer need to be. 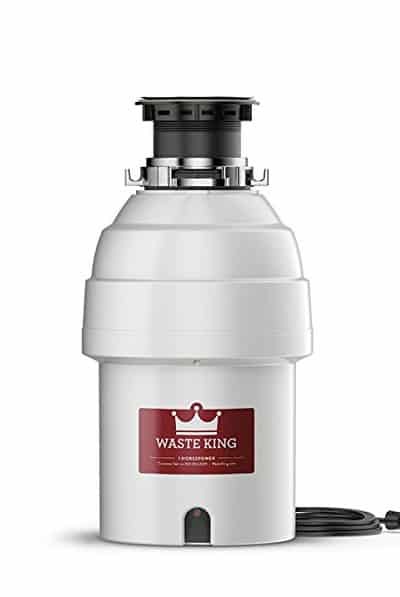 Waste King garbage disposals are known for their higher running speeds. Both Legend 8000 and A1SPC Knight run at high RPMs of 2800 and 2700 respectively. On the other hand, the InSinkErator Evolution Excel runs at 1725 RPM. Higher speeds are favoured since they help to cut through any possible jams. InSinkErator brand use induction type dura-drive motors. Waste King, on the other hand, use permanent magnet type high-speed motors. Both motors have their own advantages and disadvantages. Permanent magnet motors are lighter and simple. Induction motors are more durable and usually have more torque. I am afraid I am not expert enough to say which type of motor is best. Most InSinkErator garbage disposals use 3-bolt mounting systems. Same is the case here with Evolution Excel. Similarly, most Waste King models use EZ Mount system, and L-8000 model has that. But A1SPC model, though by Wate King, uses a 3-bolt system. Both these mounting system has their pros and cons as you can read more detailed here. Since I cannot exactly say which is better I am giving all the same points. Sound Insulation is an area where InSinkErator excels Waste King. They make the quietest garbage disposals. And InSinkErator Excel is the quietest disposal of all. A1SPC Knight also comes with decent sound insulation though not at par with Evolution Excel. The legend 8000, on the other hand, is the least insulated of all the three. Even though garbage disposals are placed hidden from view, looks matter. And looks are subjective too, so beware that my choice may not sound best to you. To me Evolution Excel looks the best, it looks elegant in its all Stainless Steel body. The L-8000 comes second with its simple design. The A1SPC on the other hand, with which I bet Waste King tried to excel in design, comes 3rd. I am pretty sure the manufacturer put a lot of their efforts into making a model different from their simple and traditional design but I don’t find it attractive nonetheless. The warranty period of a product is an indicator of its quality. A good quality product has a longer warranty than one without. Evolution Excel comes with a 7-year warranty. But on the other hand, both Waste King products; L-8000 and Knight comes with lifetime warranties. Please note that these warranties are limited warranties which cover only corrosion and manufacturing defects. Often times the splash guard of a disposal accumulates food wastes on its bottom side. These food particles will rot making the disposal smelly and unhygienic. Removing the splash guard and cleaning its underside is the only solution for this. Unfortunately, not all disposals come with removable splash guards. The splash guards of both Evolution Excel and Knight are not removable owing to the 3-bolt mounting system. But you can easily remove the splash guard of L-8000. All three machines listed here are top-end products. Naturally, they have better build quality than the rest of the products. 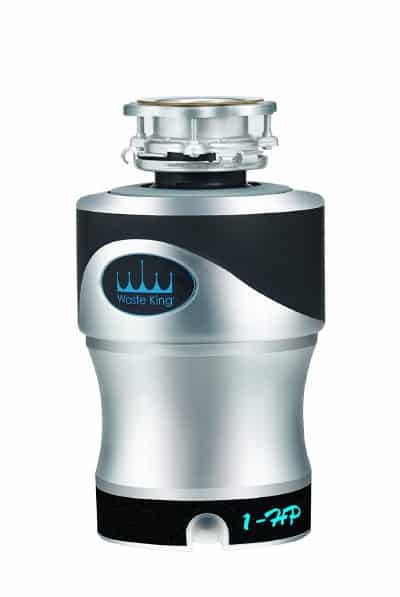 InSinkErator models are always a step ahead of Waste King in terms of build quality. Evolution Excel is an excellent example. It is made of Stainless Steel which is the most durable material used in a garbage disposal against corrosion. For the other two models, only their grinding components are made of stainless steel. Please note that the size mentioned above is not an indication of the disposal’s chamber capacity. In fact the Evolution Excel can accommodate 40oz of food wastes but that parameter is of not much importance since all these disposals are continuous feed type. But this makes Evolution Excel the most compact disposal among the three. This allows you to fix that disposal for deep sinks with constrained under the sink spacing. The Evolution Excel doesn’t come with a power cord but the other two Waste King models do. I prefer a disposal that comes with a power cord. Evolution Excel is priced much higher than the other two disposals. Comparing the prices of L-8000 and Knight both are priced similar. Evolution Excel uses a 3-stage griding system whereas the other two disposals have only 1 stage. A multi-grinding system definitely grinds food wastes finer and easier to wash away through the drain. Evolution excel has an auto-reverse system when any jam inside the disposal is detected. This works like a charm in avoiding any jams. Whatever any manufacturer claims there will always be jams in a disposal, and this auto-reversing feature helps to minimize them. As you guessed the other two disposals in my list doesn’t have this feature. I know I mentioned this before but Evolution Excel is ultra-quiet. I believe I don’t do justice without mentioning that again. The above features are definitely my justifications for the high price of the Excel model. 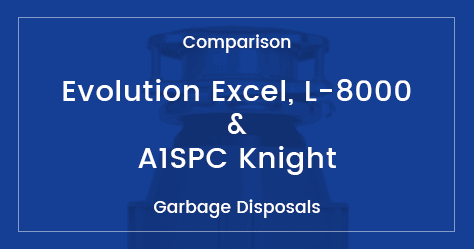 Which 1 HP Disposal Is The Best; Excel, L-8000 Or Knight? If you have the money to spare go for Evolution Excel. But I would suggest you go through the above comparison and make a decision yourself because I am always biased towards Evolution Excel. One thing I can assure you is that you won’t regret buying any of the above 3 disposals.